Enter my Scouting Contest - new winners every month! It takes youth from 10 to 13 years to progress from Lion to Webelos to Eagle Scout and, along that scouting trail, they are guided by many adults - den leaders, cubmasters, merit badge counselors, scoutmasters, and many other volunteers. Every rank of scouting has a thoroughly designed program that helps to grow a member from one level to the next. It is very important that the adult leaders follow these programs so the scouts receive the most they can from their scouting experience from Cub Scouts to Scouts, and maybe to Venturing. The program is really an outline with rules and guidelines but also plenty of room for personalization of the game of scouting by troops and packs. 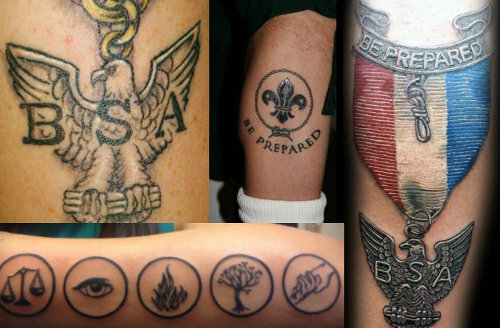 The basic foundation is found in the Scout Motto, Scout Slogan, and Scout Aims and Methods. The program leaders (youth and adults) need resources, ideas, and information to make their program fly. We hope you find useful aids here and we would love to hear any new ideas you have successfully used so we can help other groups of scouts succeed. I was asked by National in Irving, Texas to let you know about ScoutCast - a series of podcasts for Boy Scouts, Cub Scouts, and Commissioners. Choose the one that interests you and be sure to notice the 'Archives' link on the far right to hear past podcasts. View this set of Boy Scout videos explaining the advancement requirements for Tenderfoot, 2nd Class, and 1st Class. They are helpful in explaining the requirements. Or, download videos for offline viewing. The Boy Scouts of America have created some interesting public service ads and I've found some other scouting videos that are interesting. Take a look at Scouting Videos. This site began as a way to chronicle the experiences of one small group of cub scouts in Minnesota on their trail from tiger to eagle scouts. We documented our program schedules, advancements achieved, most all of our activities, games played, and skits performed. But, as things tend to evolve, we added more ideas that we thought would be fun to try some day. Soon, it turned into a resource of ideas for scouts everywhere to use. Hopefully, you'll use this site to improve your scouting program. Boy Scout Trail has scouting information for all scouting programs. Everyone using the content here to help youth succeed is welcome. This site is not officially associated with the Boy Scouts of America. I recently completed some leg work for our pack to complete the unit hornaday award. our project was approved by the council's hornaday chair. Who do I need to present this to? Is it the pack committee or the leadership team? Does it require a vote? I have a scout who has completed Tiger to Bear and was not active as a Webelo last year. He would like to finish and cross over with the current Webelo II scouts in our Pack. If he completes his requirements for his Webelo badge, then his requirements for his Compus points, and finally his requirements for his Arrow of Light, can he crossover with the current Webelo II Den? @Scouter John - There is no requirement of completing ANY Cub Scout rank in order to join a Boy Scout troop. Any member of a Webelos den should be allowed to participate in a crossing over ceremony to signify that he is moving on from Cub Scouts to Boy Scouts. If there is a separate ceremony recognizing achievement of AoL, he can use the new adventures program to earn just AoL without having earned Webelos rank, but it sounds like that may not fit well with the rest of the den's advancement. It is too late for him to earn Webelos through the old program at this point, since the cut off was June 1. Thanks for the effort taken on creating and posting this site. Just getting back into scouting (with my grandson) after several years. Unfortunately, I did not expect to become involved as a leader and donated all of my references a couple of years ago. Our pack has great support from the parents. But, they need some help with organizing their meetings and finding suitable activities. You have everything we need in one well organized site. This site is much easier to use than the references I gave away (since I am a grandparent, you should not be surprised that my references were pretty old school, aka books). I have read all of the literature I can find on service stars and couldn't find a reference to it on your site (which is unusual). My question is: what is the timeline for the service stars? In particular, if a boy joins Scouting in September, does he earn his 1-year service star on the next September? Or is it based on the Scouting year of June-May? @Brad - It is based on the individual's tenure. If he joined in September, he'd get the star at the next September. A couple sites - here and here. I JUST COMPLETED MY FIRST YEAR AS THE LION COORDINATOR FOR OUR PACK AND WITH DOING SO HAVE SUCCESSFUL FULFILLED ALL REQUIREMENTS FOR THE DEN LEADER SQUARE KNOT. HOWEVER BECAUSE LION RANK IS SO NEW IT IS NOT AN OPTION ON THE APPLICATION. WILL I STILL BE ELIGIBLE TO APPLY FOR THE KNOT? @Ryan - The Den Leader award is not available for Lion Leaders yet since it is still a pilot program. First, thank you for maintaining this site - I use it all the time. I do have a question though that I cannot find any related info online. I do not have the BSA handbook app for the iphone, so was curious to know if you or anyone else knows how they handle signing off on rank requirements with those electronic versions? We use Scoutbook for our troop and record that info after the paper book is signed off. @rick neckar - If you are using Scoutbook AND you are connected to the Scout AND you have the permission to update (granted by your Unit Scoutbook Admin) - THEN you can track partial requirements of any rank, merit badge or award. I used Scoutbook during Klondike Derby to give the attending Scouts Camping Merit Badge credit for their snow camping. I have been using your site for information for many years now. Thank you for keeping this updated and for the time and effort you put in. This is a great site! Your time is appreciated. you have a fantastic site. found the info i was looking for here faster, easier than working the National site. Lions is new program for us this year and wanted to get headstart on making sure we are organized for in-coming parents. thank you so much for making my "job" easier. Hi my name is Krystal and I was wondering my son wants to be in boy scouts he's in 7th grade. My cell phone number is 515-318-2035.
select the Boy Scouts program, and put in your zip code, you will get a list of Boy Scout troops in or near the zip code. I have a coffee cup from Troop 126 Reunion, dated Aug 1, 1992. The only other marking is S.S.S. Wolfe. I would like to return it to the Troop to put in their archives. Any assistants in locating this troop would be greatly appreciated.